CHARLESTOWN NEVIS (February 03, 2010) — A call was made to practitioners in the Financial Sector on Nevis to do all they could to carry on the mantle that would keep the jurisdiction a safe, responsible and reputable financial centre. Permanent Secretary in the Ministry of Finance on Nevis Mr. Laurie Lawrence, made the call when he addressed participants at the sixth annual Anti-Money Laundering Awareness/Combating Terrorist Financing Awareness Seminar on Tuesday. The event was hosted by the Nevis Financial Services Regulation and Supervision Department, with the theme “Compliance Requirements – The Changing Landscape”. It was held at the Occasions Entertainment Centre. “We want to continue to maintain and enhance the reputation of this jurisdiction and the service providers are a very critical component in this thrust. As such we need you to undertake the necessary work to safeguard our interest,” he said. “You know the rule; know your client and your customer’s business, these are the cardinal rules the first line of defence. “You must also carry on ongoing risk assessment, things change all the time. We live in a dynamic environment – somebody’s good today, circumstances might change and that person is bad tomorrow. So you must have ongoing risk assessment in your business,” he said. “You must continue to invest in training, not just when we have these seminars, on the job training and any opportunity to make sure that your staff is on top of the game. “Special attention must be made to new staff, frontline staff and those dealing with customers. They have to be trained,” he said. Mr. Lawrence underscored the critical importance of providers and their staff’s knowledge with the various legislations. “You must understand The Proceeds of Crime Act; The Anti-Terrorism Act. You must understand the Financial Services Commission Act. You must understand the role and functions of the FIU. You must understand the Anti-Money laundering regulations and the guidance notes. “You have to study these things and commit some of it to memory so that you could ensure that you implement these things in your daily operations. These are all extremely important so you must know the laws,” he said, citing that they should also study what unfolded in the global economy and international standards. 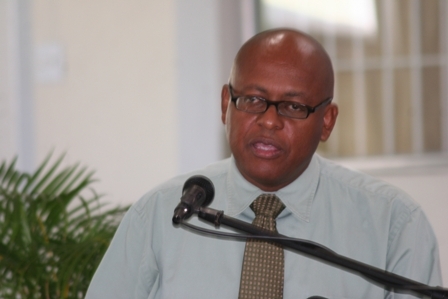 Photo caption: Permanent Secretary in the Ministry of Finance on Nevis Mr. Laurie Lawrence (file photo).